Mr. Mister was an American pop rock band most popular in the 1980s. The band's name came from an inside joke about a Weather Report album called Mr. Gone where they referred to each other as "Mister This" or "Mister That", and eventually selected "Mr. Mister."Mr. Mister may be considered as representative of the melodic sound of 1980s pop rock.The band consisted of Richard Page on lead vocals and bass guitar, Steve George on keyboards/backing vocals, Pat Mastelotto on acoustic and electronic drums/percussion and Steve Farris on guitars/backing vocals. Mr. Mister was the successor to the band Pages, fronted by Page and George from 1978 to 1981.Although formed in Phoenix, Arizona,Mr. 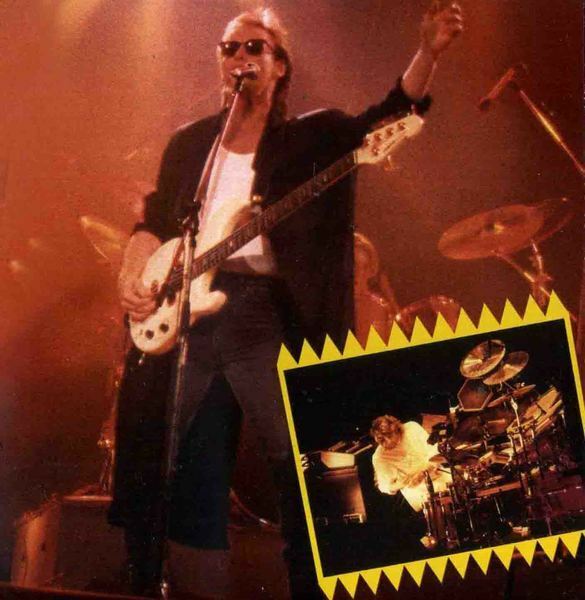 Mister was based in Los Angeles.Richard Page had previously worked as a session musician (for Quincy Jones) and had composed for Michael Jackson, Donna Summer, Kenny Loggins, Al Jarreau, and many more.In 1978, Page and his childhood friend Steve George founded the band Pages in Phoenix, Arizona. Pages explored a pop fusion sound, with a changing lineup of session musicians. Although Pages had a minor hit single with "I Do Believe In You," and its three albums garnered favorable reviews, the group had little commercial success.After disbanding Pages in 1981, Page and George focused on songwriting and studio session work for pop artists ranging from Laura Branigan to the Village People.By 1982, Page and George began putting together a more pop-oriented group with a permanent lineup, rounded out by drummer Pat Mastelotto and guitarist Steve Farris. All four members had done extensive session work for other artists and brought numerous influences to the band. 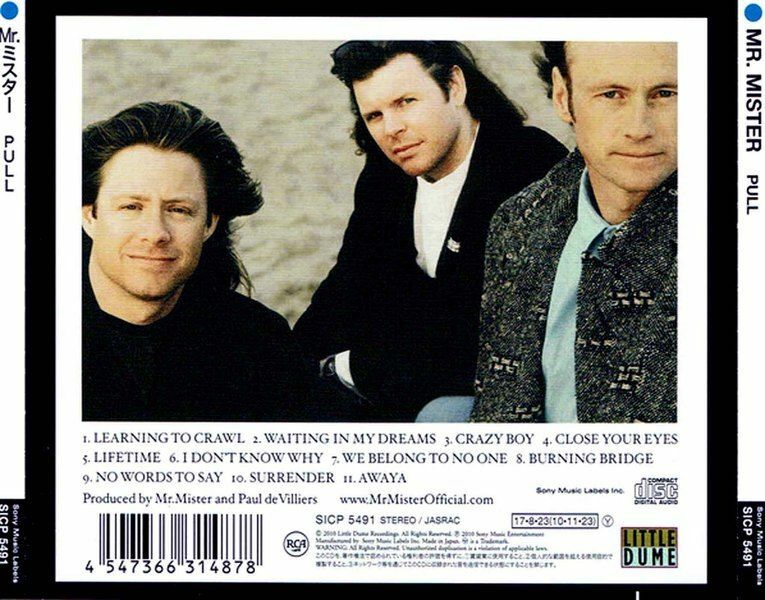 The initial plan was to bring in a fifth member (a bassist), but after realizing that Page, who was originally slated to be solely the lead singer, could hold his own on bass guitar, the members decided to remain a fourpiece.When the first Mr. Mister album, I Wear the Face, was released by RCA Records in 1984, Page was offered the chance to replace Bobby Kimball as lead singer of Toto, and later was offered Peter Cetera's place in Chicago; he refused both offers.Their second album, 1985's Welcome to the Real World—with lyrics from Page's cousin John Lang—was the breakthrough for Mr. Mister. All three singles were in the top 10, two of which hit No. 1 on the U.S. pop charts—"Kyrie" and "Broken Wings". The latter was inspired by the book of the same title by Khalil Gibran.They had several No. 1 MTV videos, and performed at the first MTV Spring Break show in 1986. 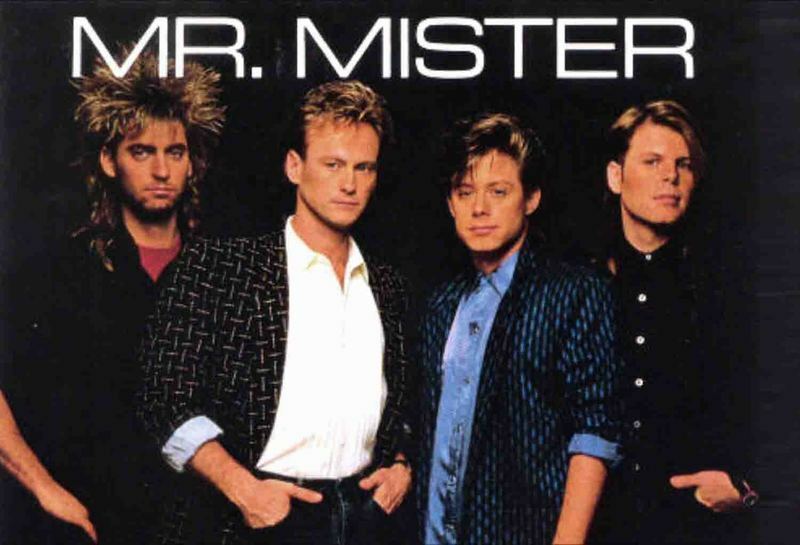 That year, Mr. Mister had two Grammy Award nominations, including Best Pop Band (which was awarded to the "We Are the World" ensemble, USA for Africa).During this time, Mr. Mister toured with other popular acts including Don Henley, The Bangles, Eurythmics, Tina Turner, and Adam Ant. The band's third album was Go On..., which was not a commercial success.During the 1980s, the group wrote and/or performed songs for several movies, including the title song for Stand and Deliver, and Is It Love as the outro track for Stakeout.Guitarist Steve Farris left in 1988. The remaining bandmembers teamed up with Christian recording artist Paul Clark and acted as his backup band for Clark's 1988 indie release Awakening from the Western Dream. Next, the band began working on a fourth album, Pull, with session guitarists Buzz Feiten, Trevor Rabin, Doug Macaskill and Peter McRea. The album was completed in 1990, but RCA Records decided not to release it. Soon afterward, the band broke up. The album remained unreleased for 20 years—though one track ("Waiting in My Dreams") appeared on a 2001 greatest hits collection by the band. On November 23, 2010 the remastered album was finally released by the band – in collaboration with Sony music – on Richard Page's independent label, Little Dume Recordings. The album is also available from Sony on iTunes and other digital distribution channels. Last year we featured some titles from the great Sony Music Japan campaign titled AOR CITY 1000, a low-priced remastered reissue on 100 classic AOR / AC albums from their back catalog, many of them out of print or hard to find. 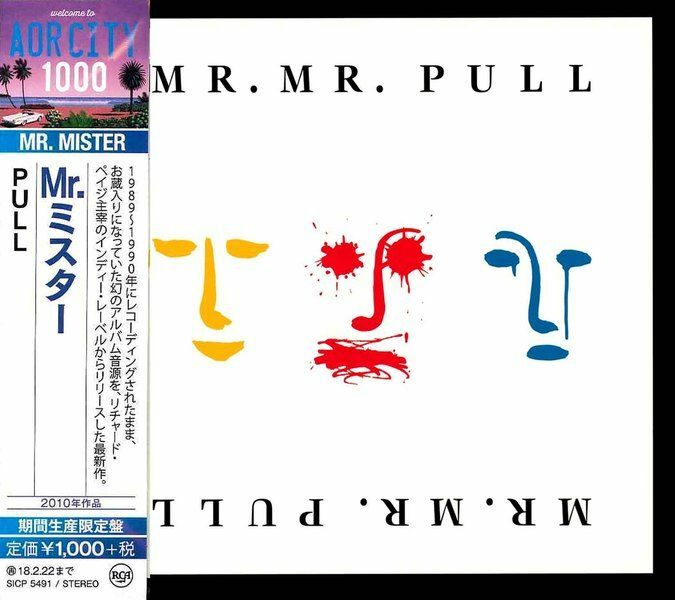 Now the label has presented AOR CITY Series Vol.2 2017, new 100 classic albums available for a limited period of time until the end of 2018.Among the items purchased, MR. MISTER long time shelved album "Pull" just arrived.The '90s seemed pretty brutal for rock bands, especially in the US. 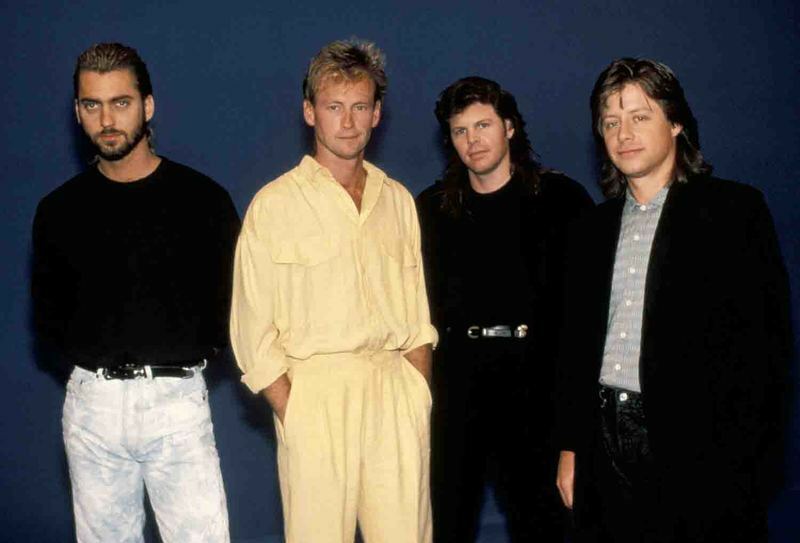 In those days before the internet really became a legitimate marketplace for artists to take their music directly to the fans, the industry had their way with bands — treating them like disposable ragdolls.If they didn’t churn out just what they wanted, they tossed them aside and moved on.Such is the case for Mr. Mister, who, after two absolutely massive hits in the mid-1980s (“Kyrie,” “Broken Wings”) found they couldn’t (and really didn’t want to) repeat what they’d already done — to the chagrin of their label. After that, they began shifting away toward more “adult” sounds.The ensuing album, Go On, was dealt pretty a pretty cool reception, but did have one minor hit thanks to a song serving as the title track to the film Stand And Deliver.The label expected a follow-up with more marketable hits. They didn’t get it. The band broke up. That’s the story we’d known for a long time, but it turned out Mr. Mister went back in the studio, recorded, mixed and fully readied a whole new album.In the words of a great Tom Petty songs: “their A&R man said ‘I don’t hear a single”-The resulting album was “too artsy,” as future King Crimson drummer Pat Mastelotto puts it in the liner notes. It got shelved, and the band, discouraged, split up.That album sat out there as a rumor and eventually a bootleg, with only one song officially slipping out to a compilation (“Waiting In My Dreams”.Twenty years later, it received a proper release as "Pull", with a fitting update in the form of a remix to bring it in line with modern standards.The good news is that it’s the best album Mr. Mister ever created. Not the most catchy, but the more mature, elaborated, and I'd say; 'elegant / intelligent'.For those who want to scoff at anything '80s, this may sound like faint praise, but it is not. Where the band had previously created albums that worked mainly as vehicles to deliver some hits, "Pull" picks up where Go On left off, where it seemed that album was too hesitant to go.The band of 'Kyrie' fame is not the band heard on "Pull", that much is true, but the music is much stronger as a whole.There was simply no profitable place on radio for a song like the fussion-tinged “Crazy Boy” or the ethereal “We Belong To No One,” fantastic though they may be. This is music too “adult” for simple rock stations and too smart for adult contemporary.Was the label right, though? Sadly, yes, if the only angle is purely marketing. "Pull" isn’t the album they were looking for, with no 'Kyrie II' or 'More Broken Wings'.You want to shake your fists at the evil record labels, but had this been released in 1990, it would have disappeared immediately. In short; Mr. Mister’s brilliant "Pull" simply arrived at the wrong time.As frustrating and unfortunate as it sounds, perhaps fermenting on a shelf is the best thing that could happen to Mr. Mister’s "Pull".Divorced two decades from its original recording, it was finally freed from the trends of the time and allowed to exist as-is. Listeners today seem much more forgiving of both throwback music and the mish-mash of genres that Mr. Mister dabble in here. "Pull" is an album that was worth waiting for, and the more you listen to it, the more you like it. I would urge anyone that has an ounce of musicality and an interest in what GOOD Lite AOR can sound like to purchase this album.I think all the songs are fantastic. As usual with everything Page and Farris wrote together, there's that depth of songwriting, where each song grows after each listening. Albums with this type of 'construction' are the ones you get stuck on.The sound quality and manufacturing of this Japanese reissue is excellent.The original release of "Pull" was done via Richard Page's own record label, not so easy to find / get world-wide now. So seeing featured in this Japanese AOR CITY Series Vol.2 results more than welcomed. Hurry up, it's available for a limited period of time until the end of 2018, sold at a really affordable price.